Pottery Avenue brings you UNIKAT RED BACOPA Stoneware Scalloped Serving Bowl. The pleasing appearance of this Boleslawiec Stoneware Bowl stems from the scalloped styling of the edges and the compact profile of the bowl. Perfect for serving side dishes, single salad bowl, or a baked entrée. 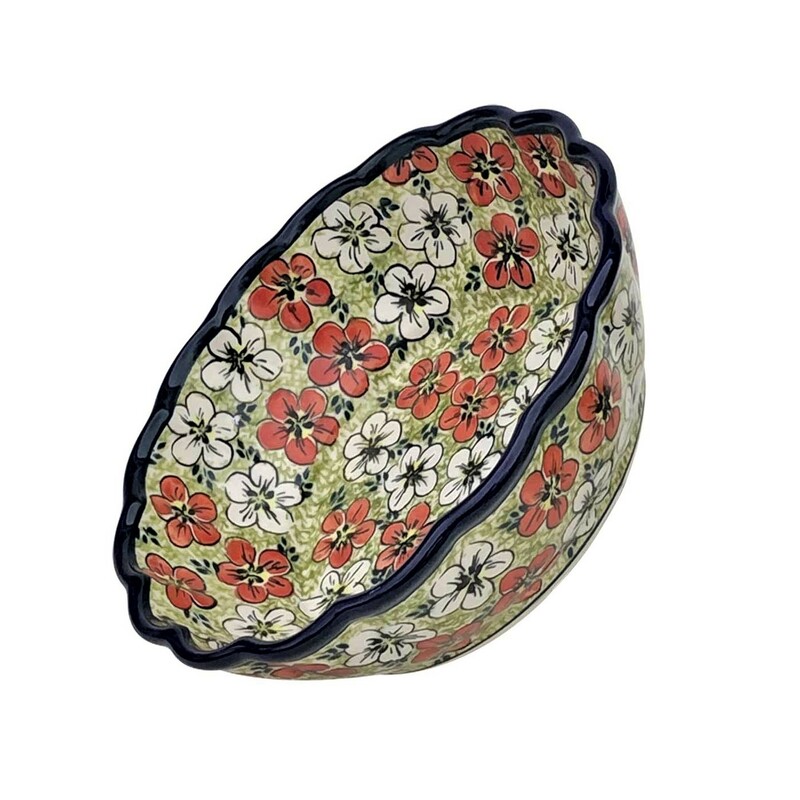 If you admire classic polish designs and wish to own one for your dining collection, This red, white and geen Polish Pottery Scalloped RED BACOPA Serving Bowl from Zaklady Ceramiczne Boleslawiec is a wonderful way to do so. The pleasing appearance of this Boleslawiec Pottery stems from the scalloped styling of the edges and the compact profile of the bowl. Perfect for serving side dishes or ala cart entrées, this Polish stoneware has a naturally non-stick surface and is perfect for oven-to-table use. The radiant luster comes from its patented glaze formula. This Red Bacopa pattern of polish stoneware presents an eye-pleasing design with a vibrant depiction of red and white flowers on a soothing green base. The clustered depiction of flowers looks scenic and the bold contrast set by the indigo blue edges along with the detailing of flower petals grants a charming update to the design. This lovely Polish pottery pattern is made using the “hand-stamp” technique and is ready to amaze your friends and family with its stunning visual appeal. This museum-quality Polish artwork comes with the artist’s signature and the Unikat stampe on the bottom of the piece. A national treasure, Boleslawiec ceramics have been manufactured for centuries. Developed from natural ceramic clay that can be found near Boleslawiec at the Bobr and Kwisa rivers. According to historical sources, the first stoneware was made in medieval times and in the early 16th century, local potters formed guilds to ensure perfection. Zaklady Ceramiczne "BOLESLAWIEC" was founded by one of the original men with the first pattern dating back to 1759. “RED BACOPA - 8.25” SCALLOPED SERVING BOWL“ is a UNIKAT pattern based of the 300 year old pattern "EYE OF THE PEACOCK". Designed by top designers and imported by Pottery Avenue, the premier importer of Polish Pottery & Polish Stoneware.